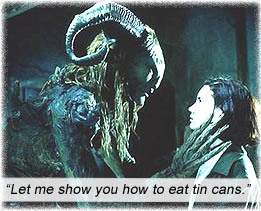 PAN’S LABYRINTH is a fairy tale, but it’s not for kids. Ironically, the fairy tales that are for kids are as dark as this tale. Set in the lush woodlands of 1944 Spain, during the waning of WWII, young bookworm Ofelia (Ivana Baquero) and her pregnant mother (Ariadna Gil) move into an army barracks with stepfather Captain Vidal (Sergi López), a ruthless fascist, bent on weeding out the last resistance fighters hiding out in the woods. Maribel Verdú is their maid, secretly aiding the resistance. The marketing for PAN’S LABYRINTH is misleading, where they push the magical wonders. You won’t find monsters appearing around every turn, rather, Guillermo del Toro writes and directs this very grim fairy tale as a drama, rooted in the real world of war – violent, painful and unforgiving. Ofelia escapes this world of constant suffering by becoming a part of the imaginative books she devours. Unlike Jim Henson’s LABYRINTH (1986) where a girl is transported to a magical world wholly separate from ours, the “magical” world in PAN’S LABYRINTH is so woven into the fabric of the real world that the transitions between the two are seamless and we don’t get the sense of being transported to another dimension, so much as the magical world infiltrating into ours. One night, a fairy leads Ofelia into the labyrinth behind the barracks, where she meets El Fauno – Pan – who informs her she is a long-lost princess of a subterranean world and can only return to her true father, the underworld king, by completing three tasks. It’s the old Three Tasks gag again, in a modern movie about ancient occultism. Doug Jones also plays The Pale Man, a gangrel creature who presides over an uneaten banquet, who has to insert eyes into his hands to see. The gore in PAN’S LABYRINTH is an organic part of its violent reality and comes at us gruesome and shocking; a doctor saws off a man’s leg – without anesthetic! ; there are point-blank executions; Maribel Verdú (who never gets to show off her magnificent figure under those frumpy maid skirts) goes hog-wild with a kitchen knife; Captain Vidal tortures a prisoner with a hammer, before his own cheek is sliced open and he must stitch it together – in closeup! The only fairy tale I can think of more gruesome is the King James Bible. aka: EL LABYRINTO DEL FAUNO. Director, Writer: Guillermo del Toro. Starring: Ivana Baquero, Sergi López, Maribel Verdú, Doug Jones, Ariadna Gil, Álex Angulo, Manolo Solo, César Vea, Roger Casamajor.